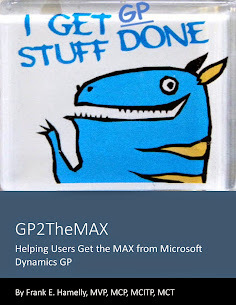 GP2TheMAX - Helping users get the 'MAX' from Dynamics GP: An error occurred while initializing or loading an AddIn . . .
An error occurred while initializing or loading an AddIn . . . 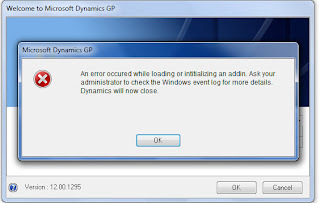 I received this error after a new install of GP2013 on my laptop. Not having yet installed any of the AddIns, it was a bit confusing. I reviewed the Windows log and it referred to a Communicator conflict. Jonathan Fear of Microsoft helped me with the tip to resolve - delete the Microsoft.Dynamics.GP.Rtc.dll that resides in the GP2013 folder. I'm guessing there was a conflict with the latest version of Windows Live Messenger/Skype because I had installed GP2013 prior to converting Live Messenger to Skype and didn't encounter this error. Thanks for the help Jonathan!